A 2013 Gartner Predictions reports stated that percentage of mobile users across the internet will rise from 20% in 2012 and up to 40% in mid to late 2013. At the same time, starting from 2013, a number of popular internet resources such as Techcrunch and Slashdot started to predict an avalanche-like rising of mobile users who demand responsive design for the websites and shops they are visiting. Finally, according to LukeW, the conversions for purchase are likely to be much bigger on mobile platforms for a number of retailers un U.S. and across the world. The Google Blog confirms the statistics by publishing their own survey results. No wonder the website of today is expected to be clean and responsive for mobile users as well as sufficiently user-oriented for desktop users. While couple of years ago mobile support was treated as sort of an add-on, it is now considered to be an integrated part of the solution. For custom product printers this means that a common website dated back in 2000-s will no longer be able to cater and bring sales from 100% of it’s audience and mobile users in particular. While common desktop users are impatient and will leave your website in couple of seconds after not being able to complete their goal, the mobile users are even more impatient and will close the browser tab in a split second, not even waiting while the website fully loads! After couple of months of R&D, LiveArt embarked on a journey of developing a mobile compliant and responsive online product designer application that will allow mobile users go for website, load designer, design a product and checkout with it in an easy and streamlined manner. The released product of LiveArt HTML5 solves a common problem of responsible design compliance and ready to be integrated into existing website with responsive design template or new website. A number of existing platforms are supported among popular ones such as Magento, OpenCart, Prestashop as well as number of others. Extending our responsiveness to whole multitude of devices is current LiveArt priority. Adding a mobile-compliant online designer to your web2print website will not only increase attractiveness of your website, but would surely pay off with higher conversions from tablet and phone users. Every manufacturer wants their customers to convey thoughts directly onto product without necessity to translate them. The results of such thoughts should be sufficiently clear and valid from the production point of view. At the same time, customer should get what they expect in terms of result. In other words, the proofing process should simple, robust and adjust customer expectations respectively. To run proofing effectively for your online design application, a couple of advices may come into use. You are welcome to share or tweet your advices that might be helpful to anyone! Have realistic product background. Unless you are printing on empty canvas, having a product on which design would look realistically is very important for user proofing. Since most online designers present frontal perspective of a designed product, it’s important to keep the product image as flat and clear as possible. Inform user on possible changes and constraints. Both product template and online design software should inform user how the design should be best positioned, so that it could be really printed. Your particular printing technology may impose constraints on how item can be designed - any of these should be clearly stated to user. Handle additional options. Certain customizable products offer additional options that user should indicate before checking out. To make these more easy on user, present them in a clear and natural way. Most users don’t like to go through lengthy forms so make sure most of the options have popular choices already selected - there’s always chance user would exactly need the default ones. Reduce extra steps of proof confirmation whenever possible. Like many others, LiveArt Online Designer Software offers user a What You See Is What You Get experience which means, if setup is correct, should offer user an instant proof during the design phase. Any additional steps, confirmation requests via email or checkbox may be frustrating for user as you distract him from his main goal - order a customized product! Good luck with proofing and happy online designing. Our team released first version of HTML/JS based online product designer software. Unlike other components and solutions, LiveArt HTML5 was developed with mobile user friendliness first in mind. Most of our QA sessions were conducted with various tablet devices including popular models based in Android and iOS. The general concept of the application is simple - people wouldn't need to install an application from AppStore or experience inconvenience because their iPad does not support Flash. In order to order a personalized t-shirt, for example, they can launch the app it directly from website page and continue surfing while their order is being processed. Target mobile users. While you still can drag text design around with desktop PC mouse, tablet users would additionally benefit from two-fingers gestures — resize and rotate. Just like in any other game or app! Powered with outstanding libraries and known frameworks (JQuery, Bootstrap, Knockout, SVG), LiveArt HTML5 is the next level of open source online product designer apps you might want to have for your business. The company developments on product designer with non-Flash technologies was planned long ago and since 2010 we've been prototyping and working with alternative stack of tools that would allow us deliver online design experience on mobile devices and alternative browsers. Back in 2009 many application developers were staking at Silverlight, a newborn alternative to Flash player, offered by Microsoft. Unfortunately, it was not competitive enough to overwhelm the Adobe Flash popularity and user spread. Despite the fact that LiveArt was offering a Silverlight version of online designer, it was decided to give up on Silverlight as the one that has low spread and would not be supported on most of mobile devices. The release of HTML5 Canvas, further support of SVG format has given many developers tools to bring common standalone applications back to web, including complex drawing applications and surely those of online product design. As the standard of HTML5 and it's supporting libraries and technologies became more stable, the development of LiveArt Product Designer, compatible as iOS online product design software and Android online product designer has begun. The designer would offer the following features and will be fully replicating functionality of our current LiveArt Lite component. Since the user experience will be much improved yet offering familiar interface the upgrades are expected to be smooth. Ready for printing techniques such as screen printing, thermal application, direct to garment print, vinyl application etc. Pricing calculation with number of variables: quantity discounts, number of colors, design area, selected product etc. The component itself would have same integration architecture which would help developers connecting the tool to e-commerce applications, such as Magento, OsCommerce, ZenCart etc. The LiveArt HTML5 Online Designer will be also part of LiveArt Shop complete solution during the mid summer and available for same license price of $2,970.00. Any questions, comments or feedback would be valuable and you're welcome to contact us! Speaking on fast turn-around and conversion rates, we would talk on how easy would user get from the front page into checkout confirmation. Normally they would meet lots of obstacles to overcome and may easily become frustrated, especially if time is value. Although there are number of usability resources across the internet, dedicated to user-friendly UI design, developers and designers are still failing to deliver nice experience to user. Why is that? Do they do this on purpose? Well, in most cases - yes. Every site owner wants their solution to differentiate with either cheap stuff, or more features and sophistication of tools or experience. The type of latter customers envision user as savvy computer hacker that wants all available functionality at once. Getting down to online design this might mean whole bunch of special and/or non-standard flows for product design like trying to upload own design image that tool has to understand in some way, then add numerous texts in various effects including distressed text with white outline put into bridge effect. Unless the above is needed for very special bulk order of some university football team, it might not be needed all at once for an average user who wants a simple "My Name Here" t-shirt. The most simple equation that is worth considering is time = number of clicks. Less clicks, less time, more conversion. Modern users hate to click or type a lot - they want straight, simple and fun experience. They want the tool or site do the orders for themselves, read their mind without having them difficulty explaining support what they want. That's it - the recipe itself is simple enough. For site owner this would always look as complex dilemma. Why should I sacrifice all the features I wanted to have on my site? Wouldn't I look simple comparing to my competitors? To tell the truth, such dilemma does not have a straight solution. What you'd always have to keep in mind is that whatever functionality you put into your tshirt design site or online product designer solution, it should be easy on user. Simplicity if the key if you want them to return again and make an order. As an agile software company, LiveArt strictly adheres to principles of software change management (SCM). For agile company this means we always thrive to deliver faster and correct issues or implement upgrades in a timely manner. Agile development allows us to plan the projects without excessive project management input, thus reducing much of the bureaucracy any project contains. Since there is no natural need to compile multiple pages of software development plan or specification, any requirements can sent to us just as wishlist, list of user scenarios you would like to happen or simply tell it in your own words. WhatвЂ™s more, one can even change requirements on the fly, our team will react respectively and replan the changes as needed. Despite the available effective methodologies, our expertise and knowledge, we still advise our customers to keep the project management triangle constraints in mind. Knowing general project constraints would help you in planning the customization in most cost and time effective way. Depending on urgency and complexity of the project that is submitted to us, our project managers will always advise best approach to address the needs and business goals for your online product designer project. At the same time we are always open to ideas which we add to our upgrades roadmap for the base versions of LiveArt. Welcome to share an idea to us and demand it's development once you become our customer. Happy designing! LiveArt Sign and Lite products are frequently confusing as they seem to be very similar, despite Sign is a cheaper alternative. This article briefly describes the main differences comparing LiveArt Sign designer software with other online design products from LiveArt. Please note that LiveArt Sign 2.0 features all of the above mentioned features and currently is the most sophisticated sign and banner online design software. Adding a LiveArt online designer to your website or ecommerce platform generally involves developing an ability to save designs and associate them with order items. There is a number of additional features that can be implemented for the designer to streamline the design and ordering process, but ability to store the designed output is the primary one. As means of communication, LiveArt uses open XML protocol to communicate with the platform of your choice. Technically, LiveArt Designer expects certain information from the platform or static XML files and sends data requests via HTTP POST back. The saved designs are normally look like XML as well along with supporting resources like uploaded images, PDF proofs and PNG thumbnails. Below is the list of basic LiveArt designer aspects which can be implemented first. Ordering and Upload. These are two basic services you would like to go ahead with and let your customers use them. Once user sends out an order, it comes to platform as special Design XML file, which you can either save locally to the file system on the server, or use DB to store additional information with it as well. Normally you would also like to associate saved design with the shopping cart item and order of the user, so that you know what was designed by user during the checkout. The same applies to Upload function - LiveArt expects backend platform to capture the uploaded file and store it either on filesystem or database and associate with the user session. Pricing. LiveArt offers a flexible service which allows you to calculate the pricing on the fly. Depending on product specifics and printing technique, you can calculate the pricing using the information sent from designer (like color count or area in inches, occupied by design) and update it respectively to the user. Product Automation. LiveArt designers require a set of information to populate product catalog, available colors and fonts. These options are normally delivered through static XML files. During the integration, you might like to manage all of these options through your platform admin area. To achieve this, a respective scripts can be developed that will read out product information from database and generate respective XML files automatically for LiveArt Designer. The same can be done for general options like font list or artwork gallery. A number of additional options are available and configurable from LiveArt’s main configuration file. For more details, visit our reference section and let us know if you miss anything you’d like us to add. Your feedback is much appreciated. Volodymyr Yatsevsky posted on March 5, 2013 How to Add an Online Designer to Your Website. An Integration Strategy. Doing a custom product business sooner or later brings up a question of offering a self-service designer to a customers, where they could design their own product online and checkout. However, since you already have an existing website, you will look to a solution which you could add to your website rather than developing a new one. How to accomplish this? Adding a hosted online design solution such as deconetwork is quite easy as they have straightforward guiding process. But what if you’d like to avoid all that recurrent fees and royalty, what if you’d like to customize your online designer to keep it as tailored as possible to your specific product or market. Would my platform allow to install a 3rd party package? E.g. such ready-made solutions as Wix or Shopify do not allow a backend or database to be modified nor allow adding any custom scripts to their backend. What platforms can the tool integrate? Is it solely for Prestashop or will it work with Magento or OsCommerce as well? What sort of products can it support? If you deliver more than one type, you would be definitely interested in a designer that will be able to cater all of your customers. What will be the output of the design? Will it fit your production or are there additional required steps to make it prepare for production? The answers to the above questions would help choosing the right product for adding online designer to your website or existing ecommerce platform. As installable package, LiveArt provides customizable designer which can be added to your existing website and offers guidance for developers. With open online designer API LiveArt designer can support any kind of platform that allows developers modifying its backend, in particular to interact with the orders database. We have been frequently asked how people could upload their multicolor products into online product designer. While shop admin always can create multiple products for different color combinations, it is not quite natural if there is just a single product in different colors. Our team gathered and we started a journey into making this process as easy as possible for both shop owners and our beloved users. The customers would generally think of picking up a single product and trying out different colors for it. One of the examples to think of is a uniform which has a number of standard areas, so called panels, to put colors on. Different teams would like to have their team colors, but they won’t be too enthusiastic in roaming through whole catalog of available color combinations searching for the one they need. It’s all about time and number of clicks or taps (here goes tribute to tablet users) that are needed to get what you want. So picking a product (one!) and picking colors you need (two, three, four...) is always better than endless picks on the catalog. Needless to say how many customers could be lost with such annoying experience. A challenge we have met is ability to support multicolor products and make it intuitive for user to select the colors needed. Thus, a two-step process was implemented - first select a product, then select applicable colors certain product supports. Now all LiveArt Lite administrators can prepare their multiple colors products for online design with a few simple steps. The technical requirements include product to be in vectors and target template file is compiled into .swf. For more information you are welcome to refer to our help article. Click to read first part of the article. Now that you have planned how your online web presence website will be it’s time to think of the online design tool for your customers. This post would be more like a checklist to go through before looking on the online design tools market and choosing a right tool for your custom product printing business. First off, you need to decide which products you will be printing on. Visualize, at least in mind, how the blank online design template would look. As the primary goal of online design tool is proofing the custom design made on a product, people should see clearly where and how design will be applied. Try to avoid low quality or images that are showing product as 3D. Next, once you have decided the on products, think of design printing process that will be used for certain product, product line or the solution in all. The printing process will affect another two important aspects for online product designer system, such as pricing calculation and applying online design restrictions. 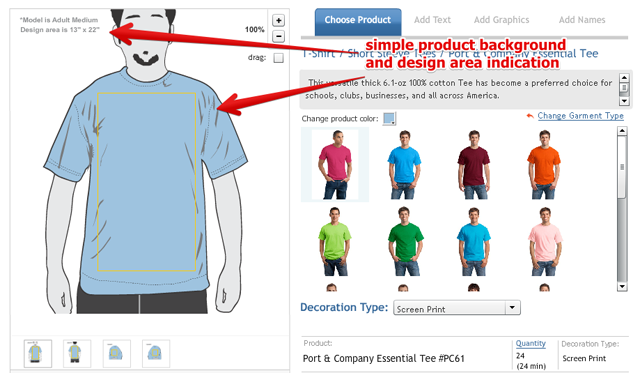 Example: a tshirt online designer allows user to prepare design on front of the tshirt (front blank image prepared, check) and order it for screenprinting. From experience, you know that such process requires colors counting to be accurate and the price to be calculated as variable that will depend on product, number of colors and quantity ordered. Additionally, a user should be restricted to upload full color images like photos as they would require completely different process. Blank product templates - prepared and checked. Design printing process - decision made and documented. Pricing calculation process - documented. 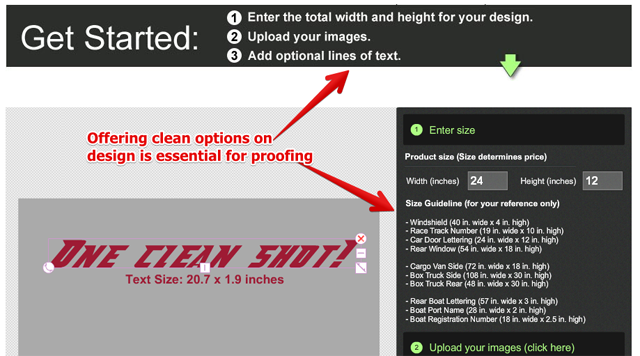 Online design restrictions - outlined and documented. Checkout, administration, maintenance - requirements documented. Having a summary document with the above, you’ll be able to select the applicable solution easily on the market, whether this is hosted system which you can rent on monthly payments basis or an out of the box component, which can be customized per your requirements. You are welcome to share ideas and let us know if this post was useful. Share your stories to us! We frequently work with both startups that normally consist of an individual designer, who thrive to get their designs online, and mature companies that know what they want in order to streamline online design ordering process and boost their online design sales. We hear different stories and feel like it would be useful to share our view on what we consider a good preparation for starting your own custom product design website or adding online designer to existing website. Since the topic is quite huge to cover up in one post, we’ll split it in couple of stories. Starting online presence for own printable business involves couple of easy yet important steps. As for any project, planning is important for launching a successful online design website where people will be able to design your product online and finalize their purchase. Accurate planning is also important to spend your budget most efficiently to get faster ROI.